We live in a society where no one accepts responsibility for their mistakes, no one is held accountable for their actions, and no one EVER says they are sorry. I have done everything humanly possible to clean up the slack, however, I feel I have no other choice than to file a formal complaint so that my entire case is reviewed. The number of mistakes are so overwhelming that I simply don't have enough time to documents each and every one with the respective agency. I have taken care of the subrogation claim, however, that does bot minimize my level of frustration because I am DROWNING in paperwork. I have contacted several agencies to assistance such as the Disability Law and Advocacy Center, however, I do not have the resources necessary to provide them with timely response. There is a very limited time allowed to Request Reconsideration, or file an appeal. Fortunately, a number of agencies will take online complaints. Unfortunately, my internet was interrupted for non-payment for several weeks and their is no funding resource or community agency that provides subsidized Internet access or free printer ink. Transportation costs are ridiculous so going to the library is not an option. Neither is returning to work right now, since it would cost too much to get to the interview or provide official (expensive) copies of my graduate school transcirpts that were oh, such a good investment! Set aside, I am not the most user friendly person right about now, so I have found it difficult to put on a happy face so I can work at McDonald's which pays more than Metro anyway. This was a lovely 54 minute conversation because he would not mail me copies of my EOBs or confirm that what, if any, requests have been submitted for payment since my last inquiry and change of address. He finally told me to call the state (Tennessee) which I have already done several times, and they told me to call Social Security but it was already past business hours and I am not authorized to make changes to my file anyway. I'll be in touch when I can. Unfortunately each agency has different deadlines, and it takes a lot of energy and time to scan in, copy, or respond to each inquiry in writing, so I find myself running out of time since I can't seem to get anything done unless I just do nothing at all. And even though my life is a living hell, I have almost learned how to enjoy the sheer irony of it all... for someone with OCD and post-traumatic stress, this is truly a ridiculous little experiment. I am becoming increasingly inspired to just burn every last document I own, throw away my keys and my cell phone and take Spotty some place where we can live off the land and ignore the fact that society has me chained to a computer screen that screen that does provide the basic necessities I need to live in this . I have come this far, and I am becoming rather skilled and at expressing myself without needing an audience or the obsessive need to check every fact, throw, and typo for capitalization and perfection. So for now... I write. Maybe later, I'll read, but if there is any justice left in this world, someday, I'll actually live. Good-bye for now. I need a break. I feel for you but am finding it hard to understand your situation where you can't afford money to print necessary forms or afford bus fair to a public library. Please understand that I am not doubting what you say, but rather that what you describe is a pretty desperate circumstance. Things may seem grim but don't drown yourself in a negative spiral. Keep your mind pinned on the positive. No offense, but that was my first thought: you can't afford bus fare, phone minutes or paper/ink, yet you still have internet access? Are you still in your apartment? My first thought: You're kidding, right? It's the government. 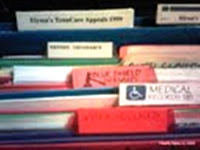 Gather your paperwork, make an appointment, haul it down there for them to make a copy of whatever they need. Might be nice if you typed up an itemized summary of whatever they are most interested in gleaning from said paperwork so they might not copy the whole darn pile so trees and taxpayer monies can be saved. While in need you trade time for assistance (money, food, healthcare) because you have 40-60 hours that most working adults do not have. Spend that 40-60 hours helping others to help you. I hardly think that is asking too much. No free lunches without something in trade. What really boggles my mind is that there are people out there who cannot afford these simple things that refuse to get out there and take a couple of jobs, any job, doing anything just to get money in their pocket. The illegals manage despite lack of English competency, what is the matter with these people? Just an ant that can't comprehend grasshopper attitudes. Ever hear of Kitty Genovese? She was murdered in New York City about 50 years ago while at least a dozen of her neighbors watched, so the indifference of our neighbors is nothing new. NO ONE called the cops. To a large extent, the rewards are on the side of being indifferent to our neighbors. Many people are petty enough to find ways to punish us for criticizing what they do, so we put up with noisy neighbors. In my building, I have learned that the annoying neighbors will be gone soon enough. Of the other three apartments on my floor, every one has turned over at least once in the year that i've been there. Part of the reason is that we have a lot of military families, but a larger reason is eviction. People are in a lot more debt than we think. It's also hard to ask for help, particularly when you think that you should be doing better, given your education. From what I've read, the biggest help for someone with OCD is to have a structured environment. I'm at the start of helping a friend who has OCD de-hoard his house. It will take months, but the thing that really makes the process painful and slow is his inability to decide to throw something out. I'm a believer in cognitive behavioral therapy, but that takes time and effort that he is not willing to apply. If one can let bulk mail pile up for seven years, the odds are pretty good that most of it is out of date by now, but that's not how he sees it. The hard part will be his basement, six hundred square feet of crap, piled five feet high. Limits federal limits for financial and certainly qualify for servies under various ADA protected categories, but what people don't realize is this... All I need is a actual, LIVING-WAGE job. Trust me, they are harder to find than you might think. I am certainly far below the income threshold and meet all eligibility requirements for various programs, but all I really want is the opportunity to be judged on my merits-- not be forced to identify myself as a recipient of federal funds so that corporation can CLAIM the welfare to work reduction. Thanks, but no. I do qualify for Vocational Rehabilitation but the state messed up records so badly that I have absoultely no idea what the status of my PASS application is. Pro-bono and nonprofits community agencies simply are not set up to deal with such complicated inter-related and complex issues. Legal Aid and TPA have both reviwed and evaluated the status of my case. Neither handle bankruptcy, student loan disputes, or ERISA disputes. The Disability Law and Advocacy Center did not show up to a scheduled negotiation. My designated representative succeeeded at doing one thing: consitently missing every single possible filing deadline regardless of the how many times I called, wrote, or complained for over three years. That is negligence in my book. Forgive me for saying so, but those are "advocates" I could do without. It would be nice if I could find someone who is professional enough to at least show up when THEY are being paid. It would be so much easier if I could, in fact, find a real paying job, however despite my best efforts, I have found very few people who can be sensitive to my situation and allow reasonable accomodations that are my no means too, too disruptive or annoying. Unfortuantely I will never meet the criteria of a rank and file employee, however I'm starting to think that maybe employers are not making the best of decisions when I look at how many of them are closing up shop. I need a job that pays, in full, on time, and does not mind my attentiomn (or obsession) to detail. I even once got fired from Red Lobster the management felt I was "not Red Lobster Material." All in all, I guess that is not such a bad thing, because when I planned goals for myself, I cannot honestly say that being "Red Lobster Material" was not anywhere near the top of my list! Unforutnately, good intent does not translate into the ability to pay salaries or related expenses such as INTERNET, telephone access or even basic transportation and realted expenses. I am finding out that there are so many more people out there like myself who are "out-the-door ready and willing to go to work" were it not for the sinking economy and underwhelming job forecasts from the Bureau of Labor Statistics. I have tried looking at this from every angle, but the bottom line is this: I NEED A JOB! Thank you for your thoughtful reply. I will no doubt be revisit your rsuggestions when I attempt to file my taxes again through the VITA program. How did I miss this refreshing post? Thank you so much for not doubting my efforts and sincerity when I tell you I've tried. I know exactly how much money I am costing society, but what I have not done is abuse the system any more than it has abused me. Surely, we all know that it is easy to skate by in American on less than $600 a month. And trust me if you have ANY illness when you go into the system, you will be so far beyond normal by the time you are through. assuming that is, that you are one the privileged elite who can meet their criteria and be poor like me! I must be pretty freakin dumb if I thought I could try. Do you still feel I am abusing the welfare system by paying for internet access? Because I would so love it you could donate some wifi access to anyoneother than myself so others can enjoy that elusive privilege of speaking loud. Surely someone can donate wifi to all us who should go without voice or recognition for using our words on the government's dime. Yeah, I guess you are right, I don't deserve internet access. It makes me angry to see comments like yours that insult my intelligeence and my sense of humor. Whatever. If it makes you feel any better, I hope you feel just fine. So you are on welfare, can't afford paper, but can afford computer? No, I don't feel sorry for you. You probably just don't want to work. Hagofall, I have no idea what you are asking. I just think it's wrong that she manages to have internet on welfare but not paper. Her priorities are out of whack. Not one thing I've read about her mentions actually looking for any kind of job. I too have a MA, but I'll take what I can get, and not take welfare. There are a lot of things going on here, for one, Bait and Switch might be a more appropriate forum for Elyssa. Not that it matters that much. People are just getting it off their chests. But the people Barbara Ehrenreich writes about in Nickeled and Dimed have always been poor and working. What I love greatly about BE's books is the writing and I am laughing through out. Irony keeps me going. But some people aren't like me in this and aren't we all so vastly different when you look at the details? When it comes to what we write via the internet, that is where we seem more alike--in our ideas. Ideas vs. realities. Anyway, nobody is going to argue with the numbers. I'll venture to say that there have never been enough jobs for all the people who need them. And now? My local internet "help wanted" site showed 250 jobs with 18,000 job seekers. And this was before all hell broke loose. And don't forget there is competition for low wage jobs too. I am fascinated with how people survive. As far as I am concerned nothing is a piece of cake when you're one us, us being the majority of human beings. And New Wave Prince, I'll apologize , because I thought you were being mean but instead we just have different ideas. Most libraries give you internet access for free. It might be limited to an hour or two a day, but you can get it for free. There are currently 1339 members registered on Barbara Ehrenreich Forum.